Carlisle United manager Greg Abbott has said the arrival of Sean O'Hanlon has been a catalyst for a three-match unbeaten run in League One. The defender's arrival has coincided with victories against Coventry and league leaders Tranmere Rovers either side of a draw at Scunthorpe. "Sean has been immense," Abbott told BBC Radio Cumbria. "That's one goal in three games he has played and I think that is seven points out of nine since he has been with us." Abbott added: "He has been a really good addition and we are delighted with him. "We have got four centre-halves now that really on form any two from four could play in most teams in this division we think they are that good." O'Hanlon, 30, was a free agent when he joined United following a spell at Scottish Premier League side Hibernian. Meanwhile Rory Loy was a surprise introduction to the first team after a month's absence, and the 24-year-old striker scored a priceless winner just before half-time - his first goal since December 2011. 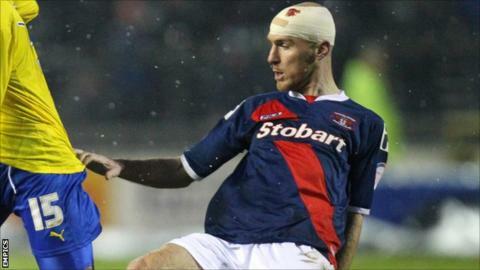 "We needed some pace up the top to put Tranmere under pressure," Abbott said. "He ran out of steam in the end but we got that from him and he got his goal."